On March 23, 2015, EMC announced it is redefining Big Data by delivering the industry’s first fully-engineered, enterprise-grade business data lake solutions. Two solutions were announced: Federation Business Data Lake and EMC Business Data Lake. Fundamentally the two solutions have many common components, with the difference being that the EMC Business Data Lake provides additional choices for the ecosystem that include non-Federation, competitive products, such as Hortonworks and Cloudera (interestingly, that compete with Pivotal HD). The Federation Business Data Lake is a fully-engineered, enterprise-grade data lake that makes enabling Big Data initiatives radically simple. Preconfigured building blocks, core Federation technologies and an open ecosystem let you focus on building new capabilities instead of a new infrastructure. A flexible, self-service, virtualized environment means you can prove the value quickly, scale out rapidly, and keep things like security and governance under control. Removing the headaches of integration means that you can start to realize the value of analytics for your business much more quickly. 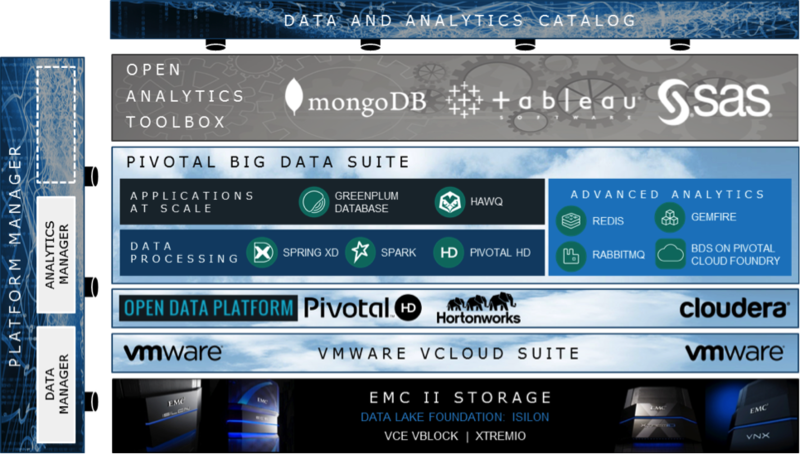 For customers looking to leverage other Hadoop distributions in addition to Pivotal HD, EMC announced the EMC Business Data Lake, which provides customers additional choice and flexibility. EMC believes that by implementing the Federation Business Data Lake and EMC Business Data Lake solutions, customers can realize value from Big Data analytics in as little as one week (instead of months) with a fully-engineered, enterprise-grade data lake solution – I think you would have to have completed a lot of preparation to achieve anything substantial in one week, the point likely being that a fully-engineered, enterprise-grade data lake solution can be up and running relatively quickly, ready to ingest data and commence Big Data analytics. As businesses look to leverage new sources of customer, product, and operational insights to develop new applications, products, and business models, volumes of data are hugely increasing, while the cost of data storage is decreasing and emerging technologies enable execution of new capabilities in real-time. This creates a game changing opportunity for IT to help lead this transformation by delivering an information infrastructure matched to how the business really wants to operate. The Big Data opportunity is also an opportunity for IT to prove its strategic value to the business by removing integration barriers and clearing a path to more timely and informed business decisions. The Federation Business Data Lake (FBDL) and EMC Business Data Lake (BDL) are both fully-engineered, enterprise-grade data lakes. As you can see in the above diagrams, both are comprised of core EMC Federation technologies (including EMC II Storage, VMware vCloud Suite and the Pivotal Big Data Suite) enabling self-service, end-to-end integration, management, and provisioning of the entire Big Data environment. This launch also included some key Big Data Services that are designed to help ensure success for customers at various levels of proficiency with Big Data. For undecided customers taking the first steps in defining their Big Data strategy, the EMC Big Data Vision Workshop can help align IT and business stakeholders to identify and prioritize feasible target use cases that will deliver meaningful business outcomes. For motivated customers that need help proving out the value of data science and machine learning, The EMC Big Data Proof of Value Service demonstrates the ROI of the target Big Data use case in a working analytics environment using real customer data. These customers typically know the use case they are going after but are struggling to put things into practice. 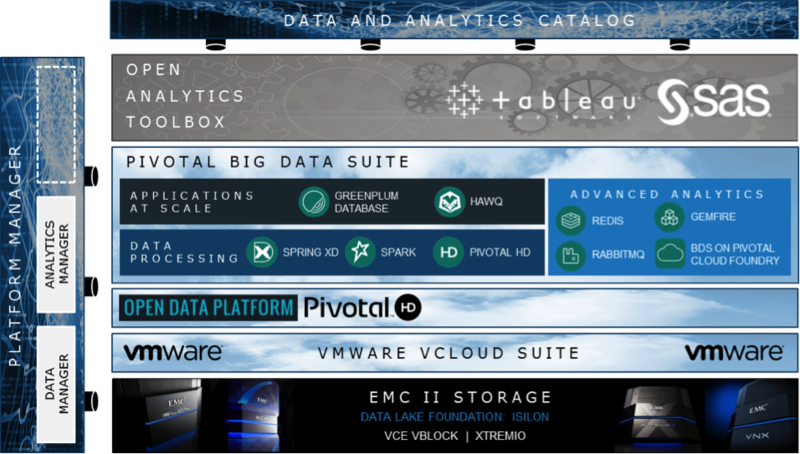 For customers ready to deploy a fully-integrated, enterprise-grade data lake quickly, the Federation and EMC Business Data Lakes deliver fully-engineered solutions built on core Federation technologies and EMC engineering, providing automatic instantiation of the Big Data environment, including storage, cluster and analytics. As an EMC Oracle specialist, I see this inaugural launch of both Federation and EMC Business Data Lake platforms as an exciting time. While it illustrates the power of the EMC Federation to bring a complete, fully-engineered, enterprise-grade, end-to-end set of solutions to support customers on their Big Data journey regardless of their stage of maturity, it also issues an enterprise-grade challenge to Oracle Corporation, showing them that they will not have everything their own way with Enterprise Business Data Lakes as they have with Enterprise RDBMS. Understanding this is the first step to Oracle Practitioners realizing the Oracle Database is now only a part of a much larger emerging Business Data Lake ecosystem. This entry was posted in Uncategorized on March 23, 2015 by dbastorage.